Because Canada is a democracy, our government must be elected by the people and it must return to the people at regular intervals to either retain their support or face defeat. The maximum term for a government is five years. Prime Ministers can request an election sooner than that if they want to. minority government: The governing party has less than half the seats in parliament. If the opposition parties voted together, they could defeat the government.minority governments. After Parliament is dissolved, a writ: in law, a formal order directing people to do or not to do something.Writ of Election is announced. Enumerators used to go door to door to update the list of voters, but this practice was discontinued. Candidates state their intention to run for office in their particular riding. Then a period of campaigning begins. The country is divided into 338 districts called ridings with roughly 100,000 people per riding. 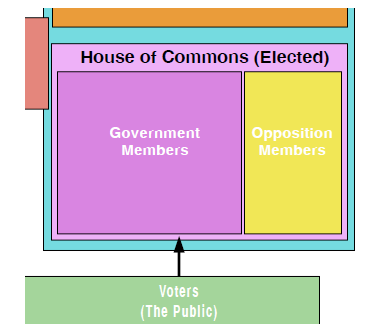 Candidates battle against each other in each riding and the one who wins the most votes becomes the riding's representative, or Member of Parliament (MP), and takes his or her "seat" in the new House of Commons. In order to vote a person must be 18 years of age and a Canadian citizen. Every voter gets one ballot and one vote. They must mark their ballots in secret with an X beside the name of the candidate of their choice. To be a candidate you must notify the local Returning Officer (the person who supervises the election in that riding) and submit a $1000 deposit with your witnessed nomination papers and the signatures of 100 electors from your riding. You don't have to be a member of a political party to run in an election. Some people campaign and win as "independents." Most successful candidates, however, come from one of the major parties: the Liberals, the Conservatives, the New Democratic Party or the Bloc Québécois.